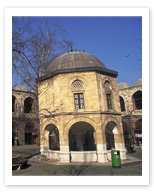 The two-story stone building standing here was once housed Bursa’s thriving silk industry, which used to dominate the commercial activities of this part of town, full of merchants, buyers, and of course, worms. The silk industry suffered for many years however, and went shortly out of style in Bursa, but with the careful prodding of the Silk Research Institute, it has made a revival in recent years. Bulging sacks of the delicate white cocoons can be found here, and silk goods can be bought right from the source at the boutiques upstairs.